The in-call quality with the YotaPhone 2 is decent, the earpiece is loud enough with the voice of the other party coming out loud and clear. Reception is good, too, with above average coverage in hallways and underground parkings as far as we tested non-scientifically. Android 4.4 KitKat dialer app supports smart dial. Upon launch, it brings you to its default dialing tab where you get a search field, the most recent dialed contact and a list of contacts you've dialed most often. You can bring up or hide the dialer by its dedicated shortcut at the bottom. It supports smart dialing both by name and phone numbers. 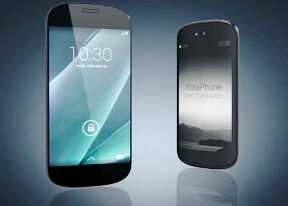 As usual we've tested the loudspeaker performance of the YotaPhone 2. It scored an Average mark, which means you should be able to hear the phone in semi-noisy environments, but to ensure not to miss any calls, we advise you to turn vibration on. YotaPhone 2 relies on the default Google keyboard for text input. It supports Swype-like gesture input, personalized dictionary, auto-correction and lots of languages. You can use Google's voice input too.